UHSR Recruitment 2017: Pt. B. D. Sharma University of Health Sciences, Rohtak is inviting applications from the eligible candidates to fill 230 vacant Teaching and Non-Teaching posts on a contract basis. Online registration for UHSR Recruitment 2017 has started from 18th June 2017. Interested candidates can apply for Assistant Professor, Senior Residents, Demonstrator and Non-Teaching vacancies on or before 9th July 2017. UHSR which stands for University of Health Sciences, Rohtak was established in the year 1960. Rohtak University provides various courses in the field of medicine. If you want to get job in teaching and non-teaching fields, you have to apply for the UHSR Recruitment 2017 as early as possible. Download UHSR Rohtak Notification 2017 from the official website www.uhsr.ac.in and check all the details regarding Educational Qualification, Age Limit, Pay scale and Application Fee, etc. If you found eligible, then apply for UHSR Teaching and Non-Teaching Vacancies before the link expires. You can get the notification and apply online link at the end of our article. If you want to apply for UHSR Recruitment 2017, don’t wait for last minute because your application may not be submitted due to heavy traffic. 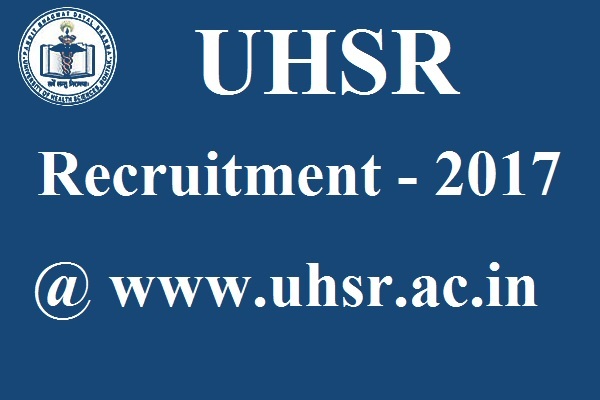 Visit the official site www.uhsr.ac.in and fill all your details. Upload necessary documents and photos if necessary. Candidates have to submit the University of Health Sciences, Rohtak Senior Resident Application Form through online mode only. Candidates must possess a Degree or Masters Degree if they want to apply for UHSR Recruitment 2017. Check the official notification for Age Limit and Age relaxation, because it varies from post to post. Applicants have to clear written test and personal interview to get your name in the final list. General category candidates have to pay Rs. 1000/- as application fee whereas SC/ST and EBPG Haryana Domicile have to pay Rs. 250/-.